Cesar says: Mono and Niche are brothers. 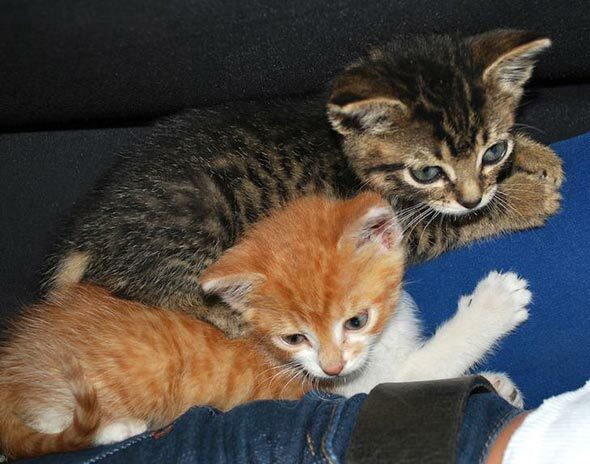 They are two Colombian male kittens that were found on a building's roof in Bogota, Colombia. At that moment they were around seven weeks old. They were (and actually are) adorable, and their personalities so different; Mono is very unquiet, while Niche is more calm and shy. Now they are living -- by the way, very happy -- on a farm located one hour northwest from Bogota. Ah! So delightful these two, and glad to learn about their forever home. But how did they get up on the roof? All their photos are keepers, too. Where are you kitty? HaHa. Cute picture of your little self. I hope you guys are having a grand-old-time on the farm. Ginge 9 weeks from spca our kitten.